This deck celebrates the culture of Lucha Libre, a type of wrestling with roots in Mexico but popular worldwide. Luchadores is the term for the wrestlers themselves. Colorful masks, high-flying maneuvers and rapid sequences of holds are common characteristics of Mexican wrestling. 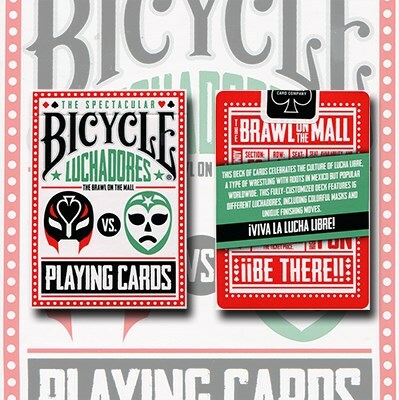 This fully-customized deck features 16 different Luchadores, including colorful masks and unique finishing moves. Hand-drawn number cards, court cards, and Jokers. Bicycle® decks are made in the USA and feature the patented Air-cushion® Bicycle finish, softly beveled edges and sandwich construction for enhanced game play.